Grammar can be a teacher's nemesis, can't it? As stated in my last post, "Why Spiral Review Can Save Your Sanity" (which discusses how and why spiral review works), sometimes it can be so frustrating to see students forget and not apply concepts we've already taught them through our grammar instruction. To add insult to injury, it can take so much precious time out of our already very restricted schedule. Many times we are given a 90 minute (or less) block to teach reading, writing, AND grammar, and we feel like something's got to give. Well, what if I told you that your grammar instruction could take LESS than an hour per week to implement, and that your students' mastery of grammar standards would improve significantly? It's totally possible, I promise. 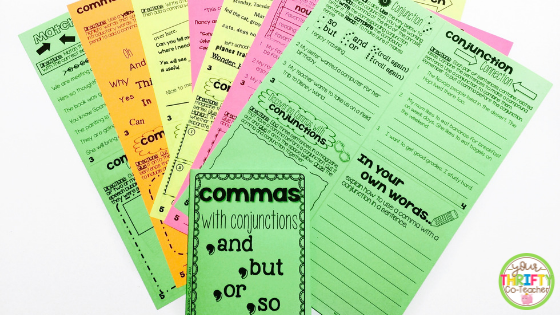 Let me guide you through this efficient method of teaching grammar. 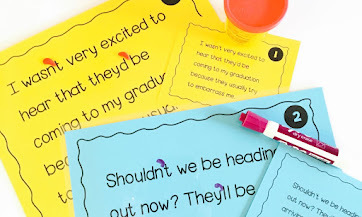 Next, provide students will some time to practice the new standard you have just introduced them to through preplanned activities, worksheets, games or task cards. You can allow students to work with a partner or work independently as you walk around and scaffold as needed. This part should also take no more than 10-15 minutes. So in total, Monday's lesson should run no more than 25 minutes. To make planning as easy as possible while keeping within the time constraints of this initial grammar lesson, the resources I use each week are these Print and Fold booklets.They're concise, to the point, and engaging for students.The simple, yet thorough design of the Print and Fold booklets makes it effortless to plan the grammar lesson of the week. I literally just print them out and I'm done. I also love the fact that my students glue them into their interactive notebook and can easily refer to them throughout the school year. What my students love about them is the interactiveness the booklets offers through the different activities in each resource. Time saving + effective + engaging = BIG WIN! You can read more about them and how I implement them by clicking here. Now it's time to allow students to get some daily practice. On these days, they will implement the new standard you introduced to them on Monday while also reviewing standards previously taught. You want to keep those standards fresh in their minds. The best way to do that is to apply previously introduced concepts on a regular basis. Daily practice?! Who has time for that?! This sounds time consuming, doesn't it? Well, I can tell you with total confidence that you can do this in just about 5-6 minutes daily. How? Just set up a morning routine with a sentence editing task that incorporate the standard you taught on Monday and sprinkle some previously taught standards in as well. 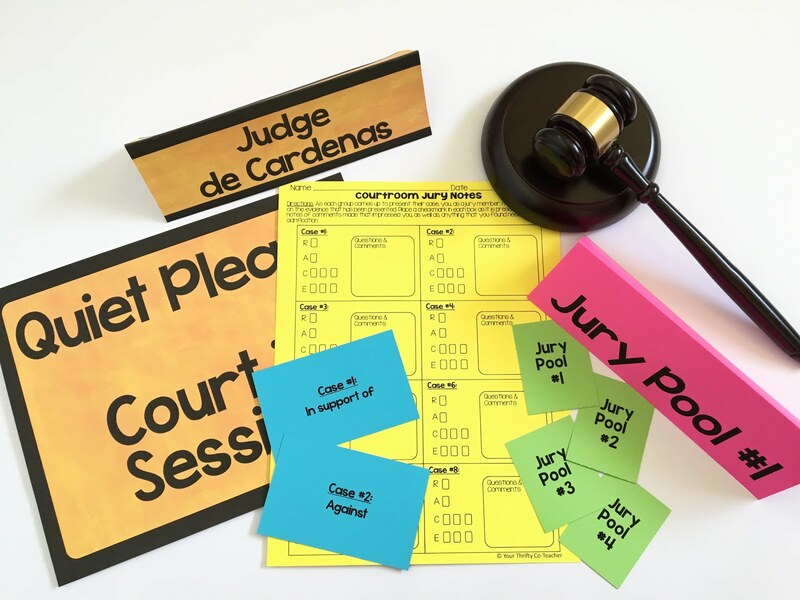 To do this, you can give students a pair of sentences to edit daily, set up a timer for about 4 minutes (that gives them about two minutes per sentence), and then quickly review the errors as you project the same sentences on the board. To do this, call on students to tell what error they found in the sentence and have them explain WHY that is an error and how to fix it. Try to have students call out the errors in the order they show up in the sentence. A fun way to encourage participation is to toss a reward at them when they answer correctly. These can include mini erasers or small candy such as a Starbursts. 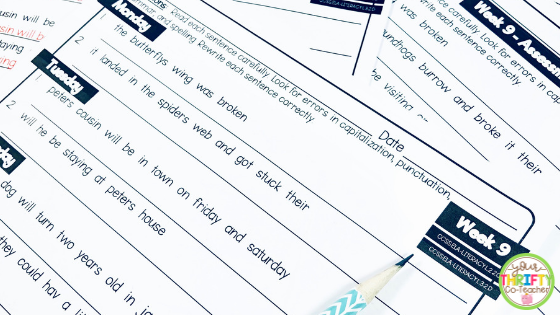 To save time and effort on creating a new pair of well developed sentences each day that incorporate the new standard introduced for the week and previously taught standards, I use this Daily Fix It Sentence Editing resource. 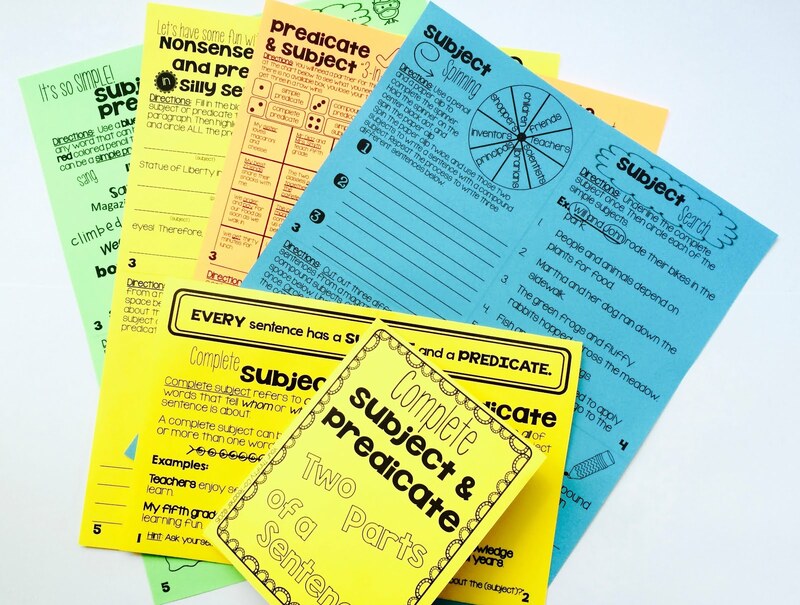 It saves time and effort by already providing the sentences for each day, and builds from one week to another by including standards previously taught. 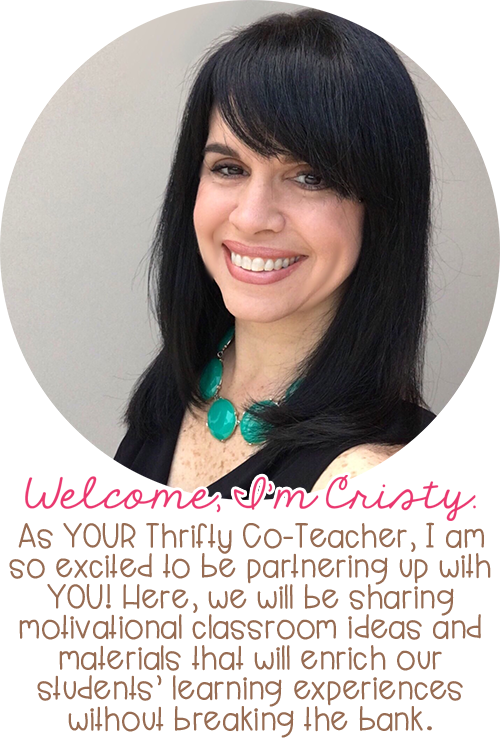 This resource also allows students to edit right on the page, and even includes the CCSS being taught that week on the corner of each page for easy tracking. 🙌 Students can keep the page in their writing or morning work folder and just pull it out each day as they start class. I like to collect them and staple them to the back of their weekly assessment to have a record of their performance during the week and compare it to the results on their test. After reviewing the last set of paired questions, it's time to assess. The first option is to provide students with a paragraph that once again includes the standard introduced for the week and previous standards taught. 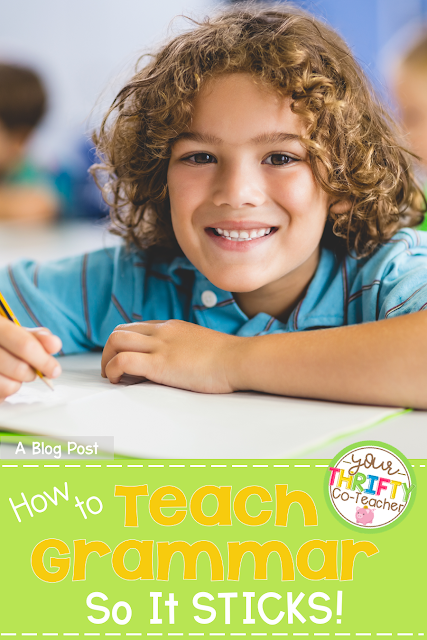 The advantage of using this type of assessment is that it helps assess whether your students are retaining and are able to apply information previously taught. It also has the advantage that it is set up more like what the student will be exposed to in most state standardized tests. This will eliminate the need to review standards and test taking strategies at the end of the year before high-stake testing. The second option is to provide students with a "Quick Check" assessment to asses only the standard being taught that week. The benefits of using this form of assessment is that you are able to see if the student has mastered the skill in isolation. It is also a great option to assess understanding in English Language Learners and SPED students who may get confused or overwhelmed when too much information is provided to them at once. These types of grammar assessments are usually not too long and should take no longer than 10 - 15 minutes. 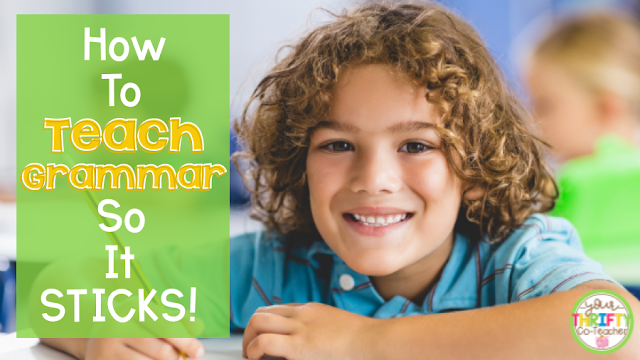 If you'd like to receive my 5th Grade Grammar Pacing Guide now, alerts when the 3rd and 4th Grade Pacing Guides are posted, and free resources on strategies for teaching grammar, sign up to receive emails below.